Renderings of the new Tobacco Road have been released through the Facebook page The Oski Foundation. They show a new, more upscale looking Tobacco Road, which will open in the lot across the old bar at 69 SW 7th Street. The renderings show that the top of the old bar will be used in the new location, which was saved before being torn down, along with the old "Hot & Cold Running Liquor" sign that used to hang above the front entrance. Photos of the old location adorn the bar, along with framed flyers of past shows played at Tobacco Road. 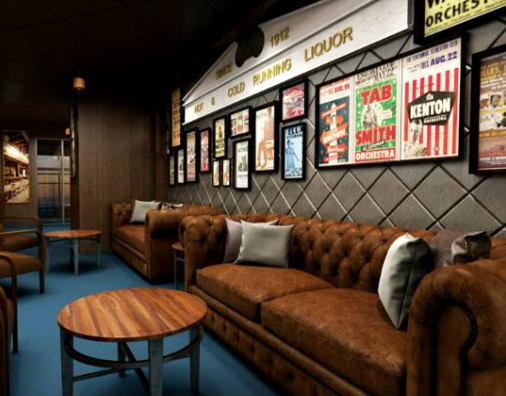 Leather chairs and couches will surround the main bar area. Tobacco Road had its closing party on October 25, 2014 before being demolished a month after. Pre-demolition photos can be seen here. Update: Renderings are of the Tobacco Road on the Norwegian Cruise Line Escape.